Pigeonholing Paul Weitz is not a good idea. 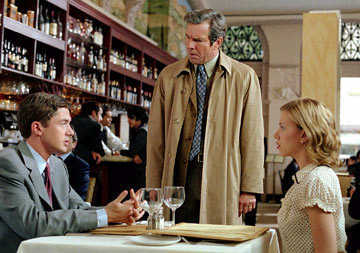 The first time people really took notice of him was in 1999, where he co-directed American Pie with his brother Chris. For better or worse, everybody thought of him as a gross-out teen person. Then came the forgettable Down to Earth. Then the big surprise, a surprisingly warm and tender adaptation of Nick Hornsby's About A Boy, one of the best films of 2002. Hey, maybe there is something more substantial to Weitz than genitalia in pie jokes. In Good Company, both written and directed by Weitz, reinforces these sentiments. Although it is not as good as the former, it does show a unique understanding of the male ego, especially as it pertains to work. Unlike most other films that center on the workplace, this is not an all-out comedy, nor does it turn violent. It is more a film that examines the importance of work versus family, and the consequences of choosing one over the other. The performances are the best aspect of this film. This is a breakout role for Topher Grace (P.S., Win a Date with Tad Hamilton! ), who has been slowly building a diverse resume, and his long-running television show is nearing an end, helping to facilitate a jump to the big screen. He hasn't wowed anybody yet, but he does so here. 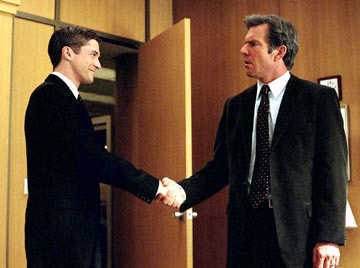 Even better is Dennis Quaid (Flight of the Phoenix, The Day After Tomorrow), an effective chameleon in whatever he does. As Dan Foreman, Quaid finds himself the victim of a huge corporate merger. He is head of ad sales at a national sports magazine one minute, and finds himself second fiddle to Carter Duryea (Grace) the next. A demotion is humiliating enough, but the fact that Duryea has no relevant experience and is only 26 makes it worse. Duryea realizes that he lacks skills, so he keeps Foreman around to show him the ropes. Foreman stays because he needs the job. His daughter Alex (Scarlett Johansson, A Love Song for Bobby Long, The Spongebob Squarepants Movie) wants to transfer to private college and his wife (Marg Helgenberger, Erin Brockovich, Species II) is pregnant. Duyrea is freshly divorced and out to make a name for himself at the company. He is mandated to raise revenue while cutting costs, which typically means firing staff. Because he has few familial obligations, he pushes Foreman and the rest of the staff hard. Until he realizes he has no life. At one point, he invites himself over to the Foreman household for dinner and meets Alex. The two begin a clandestine relationship, and this, along with a budding respect/friendship between Duryea and Foreman, causes Duryea to realize just how empty his life is. Foreman loves what he does and has a great family. Duryea has a new car, an empty house, and no friends. It's not hard to see which one most people would pick. Oddly enough, the relationship between Alex and Duryea is the least interesting facet of In Good Company. It serves primarily as a wedge between a growing friendship between Dan and Duryea. Duryea is looking for anything to hold onto which would give him the semblance of a life. Grace carries himself with a sense of ease. He has a pretty laid-back approach to acting that looks extremely natural. The real drama in this film comes from watching the opposite reactions of Dan and Duryea. Dan sees his entire life slipping away from him. Before he had a comfortable job he enjoyed, and a happy, loving family. Now, everything is in a state of flux, and he is at a position in life where career-wise, it is difficult to move on or start over. Duryea realizes that late nights and kissing up to bosses mean little if he has nobody to share it with. These are pretty sensitive topics, especially for men, and Weitz conveys them with a minimal amount of schmaltz. Mongoose Rates It: Not Bad. 1 hour, 50 minutes, Rated PG-13 for some sexual content and drug references.